Pretty two bedroom Cottage (sleeps 3) in one double and one single bedroom, both with air conditioning. Facing east to catch the refreshing trade winds, which together with the high vaulted ceilings and fans throughout, provide a feeling of space keeping the property wonderfully cool. The open plan layout is ideal for a holiday. The finishes throughout include pickled pine, coral rendering and tile floors which give a real beach house feel and epitomizes inside outside living. It is well furnished with wooden furniture throughout plus satellite TV and wifi. A breakfast bar opens into the simply equipped kitchen including a washing machine. The reception room and the kitchen both open through French windows onto a large veranda that runs its length, offering plenty of room for sitting and dining, overlooking the large sparkling ceramic tiled pool. 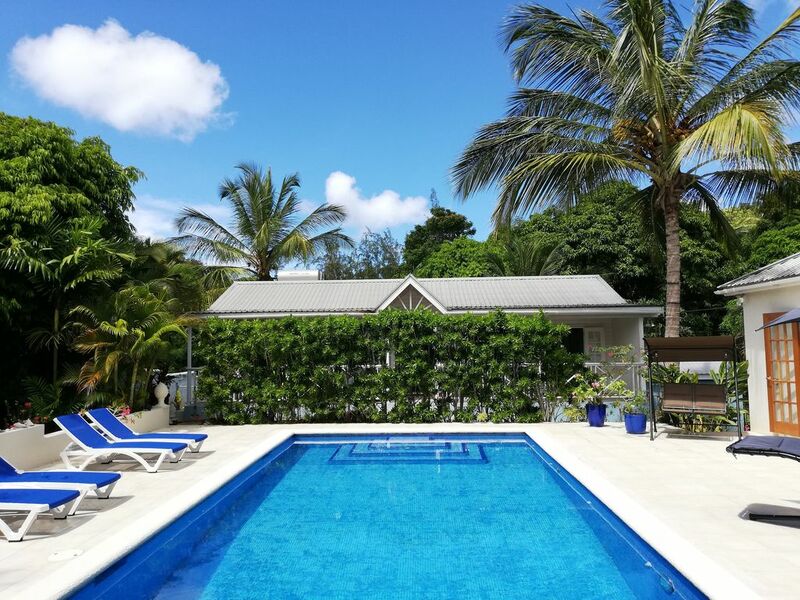 Set amongst a mix of four holiday units in a lush tropical garden with a sparkling pool and an oversize deck. A great spot moments from Gibbs and Mullins beaches on the famed platinum West Coast. Walking distance to bars, restaurants and convenience store. Come and enjoy a wonderful stay complete with sunshine, sunsets, golden sand, clear blue sea and Bajan hospitality. Gibbs Glade is set in a serene, forested area. Our cottage opened out to a pristine pool. The proprietors were very friendly and always available for any need. The beds were comfy and the space was immaculate. If you want a sea bath, it is a short walk away. A truly excellent experience! Recently returned from Gibbs Glade Poolside studio having spent 2 weeks in this lovely location. The owners, Toby and Karen were really kind and welcoming and nothing was too much trouble, even finding tonics for our G&T's, as temporary shortage of supplies on the island!!!! The studio was large spacious and beds very comfortable. Cooking facilities basic but adequate for our needs. Air con and wifi good and all opening windows were fitted with mosquito nets. The studio has 3 sets of French doors which open onto pool patio and front terrace making the accommodation very lite and airy. This establishment only opened in September 2016 and apart from a few minor alterations to facilities which the owners welcomed the studio is superb, The location was perfect, close to Mullins and Gibbs beaches and local bus network. Local shop, bars and restaurants all within walking distance Can recommend Bombas and Mullins Beach Bar to eat or try restaurants in Holetown as plenty of choice . A car is not essential as buses run all over the island and riding on the yellow reggae buses is an experience not to be missed!!! There is a short cut to the highway and beaches through a wooded area but prone to flooding when it rains heavily. Take a torch. Our personal thanks to Toby Karen and the staff for making our stay so comfortable and memorable. Lovely cottage near two great beaches. Charming rooms with air con and gauze on all windows---essential in Barbados. We were unfortunate in that for our time there building construction was taking place very close to the property. However without that happening the cottage would definitely have had five stars . The pool is perfect . My family and I have enjoyed a fabulous two week stay here at Gibbs Glade Cottage. I would highly recommend if your thinking of going to Barbados. We are a family of five, including our three boys 4, 11 & 13 we found the accommodation perfect for our needs, very clean and well equipped with everything you would need for a self catering holiday. My husband normally struggles to get a desent nights sleep while away from home but to our delight the the mattress was so comfy. Our boys all agree the pool was a perfect size and surrounded by a very pretty well maintained garden which gave us the feel of being private without feeling in the middle of nowhere. We spent most of our days relaxing on the beautiful Gibbs beach which was a few minutes away and very quite with only a handful of people around. The owners Toby and Karen are also lovely people and went out of there way to accommodate our needs. The only negative I can find with staying here is going home will be torture. Many thanks from the Esposito family for a wonderful holiday and we hope to return soon. A lovely cottage in a very quite and peacefully spot. Just a stones throw from the beautiful beach. Couldn't have wished for a better place to stay, we would certainly love to return. The two closest beaches to Gibbs Glade Cottage & Garden Studios are only a short stroll away... Gibbs Beach - a beautiful and peaceful beach, lined with glorious private villas. Mullins Beach - a busier and more lively beach with a bar and restaurant, where various water sports are available. Gibbs Beach is an easy short walk, through Gibbs Glade itself, along a path to the main coast road, diagonally opposite which is a path to the beach. Soft, warm, white sandy beaches await you all around Barbados with a coastline to suit every taste. The Platinum Coast, on the west, has a glorious silvery shoreline lapped by calm Caribbean waves. Snorkeling in the clear turquoise waters is a great way to see the hawksbill turtles and explore the shoals of tropical fish inhabiting the coral reef. On the East Coast, the dramatic Atlantic Ocean crashes over wild rugged rocks, wonderful to watch and ideal for surfing. The long rolling waves of the South Coast are perfect for body boarding. Set about half way between Speightstown (local and quiet) and Holetown (busier and more vibrant). Both have many bars, restaurants, shops and supermarket, both are right on the west coast. Hire cars are always a great and flexible way to see all that Barbados has to offer, especially if you have children. However, if you simply like to chill by the sea, then buses are a less expensive option, running up and down the coast road every few minutes. Taxi's are only a telephone call away for those special nights out!